What began as a past time would eventually pave the way for his life. For Makonnen, music is do or die. Starting with writing and producing in between shifts at his hotel day job in his hometown of Atlanta, GA, Makonnen (born Makonnen Sheran) decided to ditch his regular gig and focus solely on his music career. Since then, Makonnen has become the industry’s hottest new voice. He received an explosive boost from the hit “Tuesday” after Drake released a remix of the anthem and later signing him to OVO. Believe me, it’s just the beginning to a long line of hits coming in the future from the 25 year old. I recently witnessed him perform at 1Oak Las Vegas and he gets the club goin’ (wait for it) up! With “Tuesday” already cemented as one of 2014’s bangers, genre-bending Makonnen shows no sign of slowing down by releasing his major label debut and announcing his United States thirteen city tour. 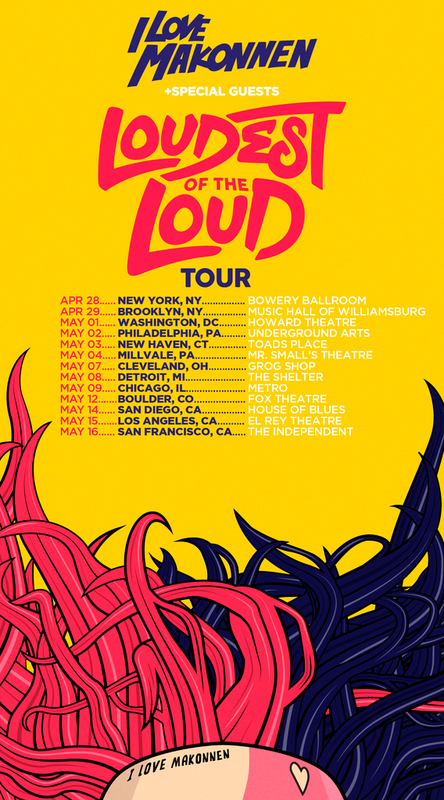 Dubbed the “Loudest Of The Loud” tour, it will begin in New York City at the end of April and continue cross county until its last May date in San Francisco. Tickets are on sale now. Check out the tour dates above and visit ilovemakonnen.com for more ticket information and make sure to download the “I Love Makonnen EP” on iTunes. A.K.A. Vanillatrilla enjoys making mixes, copping sneakers, collecting vintage sportswear, reading biographies & napping.